It is not easy to understand the reasons for a home suffering from condensation, damp walls, and mould. We are often asked to inspect a house suffering from condensation only to find the owner or landlord has already spent money on repairs that have had no effect. While these repairs may (or may not) have been necessary anyway, we find they have often been carried out to deal with condensation and mould - which is a result of too much humidity in the home. Here we take a look at some of the 'wrong' repairs - remedial work that didn't get rid of mould. It faces the prevailing weather and driven rain is penetrating the wall. So there are some good reasons for ensuring your pointing is in good condition. However it is important to understand the difference between problems caused by degraded pointing, and problems caused by condensation. Our Damp Home Diagnoser will help you understand what type of damp your home suffers from. then this is highly likely to be caused by condensation. Re-pointing one or more walls may be necessary - but don't expect it to cure condensation and mould. Similarly there are occasions when roofs need repair. Penetrating damp caused by a roof leak will produce very different symptoms than dampness caused by condensation. When you have a roof leak (or a leak through the wall) this will result in a very defined dark patch that may feel damp to the touch. This is very different from condensation which is usually visible in different places or in different rooms. So, if you believe your roof is in need of repair for example if there are slipped or missing tiles, or the pointing along the ridge tiles is missing then seek advice from a reputable roofing contractor. Bear in mind that this will not solve mould forming on your shoes in the wardrobe ! The damp proof course in a wall acts as an impermeable barrier preventing water rising through the wall. Where the DPC is missing or it has failed then dampness can result. Failure of the DPC is more likely to be an issue in older houses (pre-war). Rising damp can only affect the walls on the ground floor. If you have a condensation and mould problem on the first floor of your home then clearly this cannot be caused by a failure of the DPC. 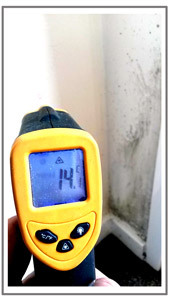 Walls get colder near the ground - is this mould from condensation or a failed damp proof course ? A complication is that if the DPC has failed, and the wall has become damp, then this will make the wall colder and so more likely to attract condensation. In the example shown in the photo, this home was a bungalow built in the 1960s. The mould has a diffused appearance and has formed because the house was excessively humid causing condensation on the lower, colder, part of the wall - not because of a failure of the DPC. Understanding what type of damp problem your home suffers from might not be straightforward. Your house may have damp walls and mould but will a particular repair solve the problem ? Get advice from different sources. Ask what the benefit from a particular repair will be. Ask what warranties are available. Seek an assurance that what is being offered will deal with the problem.